Nothing quite beats the clean lines and uncluttered look of an insert fire. No flue to look at, just an appliance on the wall surface. Clean, elegant and simple. 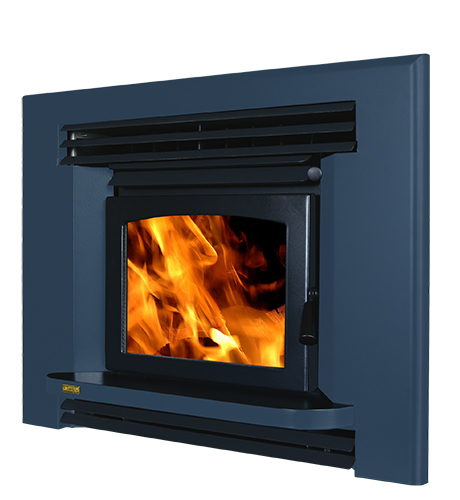 The Ares has all the intelligent combustion features, high output and and low fuel consumption of the freestanding models, with the benefit of discreet wall mounting. Perfect if you have an existing open fire or log burner, the compact firebox design means there will be no trouble fitting into even the smallest open fireplaces, but don’t let the compact firebox size fool you. It can pump out a generous 14kW of heat, making it comparible to much larger rivals. Add the extremely low emissions and high efficiency, and you’ll realise that you’re generating heat where other fires are just making smoke. Better for the environment, better for your wallet, and better for your home. If you are building new, or renovating a home without an existing fireplace, just add in the optional Zero Clearance Kit to build your insert fire into timber framing and floors. The Ares gives maximum flexibility with minimum fuss, for the custom look you want. Couple all this with the large entertaining viewing window, and the ability to choose from over 100 custom colours for the front facia and you have everything you need to stylishly heat your room.